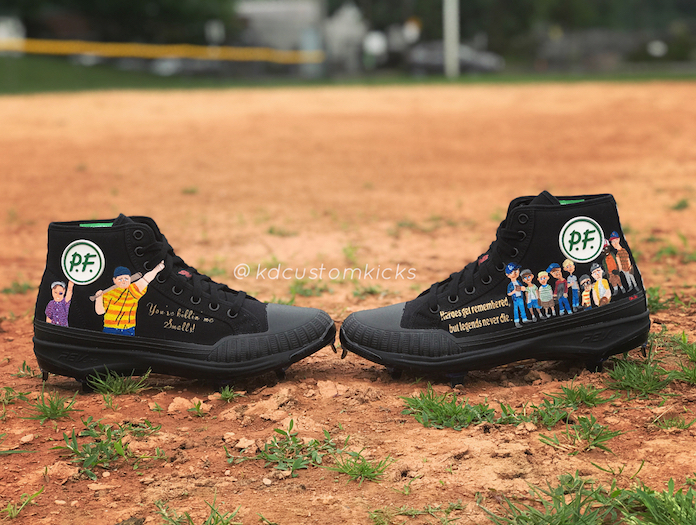 The Sandlot is forever remembered on a pair of PF Flyers cleats! Earlier this year for the 25th anniversary of one of the greatest baseball movies ever, The Sandlot, New Balance teamed up with PF Flyers to make a baseball cleat like the classic canvas black hi-tops game ready. Customizer kdcustomkicks and Major League Baseball player Taylor Motter took the tribute to another level. In the movie, the PF Flyers are made iconic by Benny “The Jet” Rodriguez as he put on a fresh pair since they were advertised to make you run faster and jump higher. They were his “secret weapon to pickle the beast.” KD Custom Kicks memorialized Benny with The Jet tagged on the heels. The Sandlot icons and characters were all painted across the black canvas from all 9 of the Sandlot boys to the Babe Ruth ball to Hercules and last but not least Wendy Peffercorn on lifeguard duties.